With city officials, community leaders and invited guests in attendance, Belfast Mayor Samantha Paradis cut the ribbon as we celebrated the official opening of our Belfast office on Saturday, November 17. 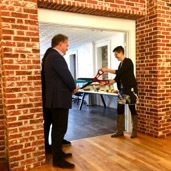 The opening ceremony and reception that followed gave company officials the opportunity to show off the renovated office space at 159 High Street and to introduce the staff who will be working out of the office. Centrally located in downtown Belfast, the office will serve as our local base of operations while our salmon farm is being permitted and built, as well as an information center and exhibit space where the public can drop by to learn more about our project and what it means for the community. The opening was covered by WABI TV in Bangor which aired this story. Pictured: As President of NAF inc. Erik Heim and Commercial Director Marianne Naess look on, Belfast Mayor Samantha Paradis cuts the ribbon at the official opening of Nordic Aquafarms office in downtown Belfast on November 17th. Last month we were pleased to share a letter of support from the president and CEO of the Gulf of Maine Research Institute. We subsequently received additional letters from prominent organizations and individuals in support of our discharge application to the Maine DEP. He concluded his letter by stating: “Having reviewed Nordic Aquafarm’s permit application and met with the project team, CLF believes that the discharges of nutrients from the proposed facility should be permitted.” The full letter is available here. The DEP has also received letters of support from Maine & Company, the state’s leading business attraction organization, and from Janine Bisaillon-Cary of the Monserrat Group and a former director of the Maine International Trade Center. We are most grateful for these important letters of support. We want to congratulate incumbent city councilors Mary Mortier and Neal Harkness and newly elected councilor Paul Dean on their success in the recent city-wide election. Like Belfast’s mayor and the councilors not up for re-election, they all support our land-based salmon farm continuing to move forward through the permitting process. While the slate of candidates opposed to our project all lost, we recognize that there are people in Belfast who have concerns about our project, and we pledge to continue to work in an open and transparent manner with all citizens to make this the best possible project for Belfast and Maine. On Wednesday, November 28, we held our fifth public meeting since announcing the project in January.This one was a little different, however. With the city council elections behind us and permitting under way, we felt it was good time to just have a good old-fashioned conversation with the people of the Belfast area. Pictured: Commercial Director Marianne Naess opens our Community Dialogue on November 28. 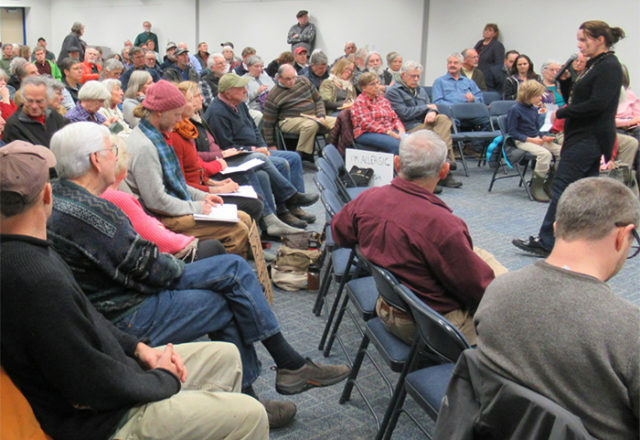 No PowerPoint slides, no long presentations, no panel of experts – just local citizens and our staff engaged in a dialogue about how we can make this the best possible project for the local area and the State of Maine. We were pleased that more than 200 people showed up at the Hutchinson Center for the meeting, which went on for two and a-half hours. Everyone was civil as they posed questions or offered comments in person or on file cards. It was a healthy discussion featuring both project supporters and opponents and every member of our team participated in providing information. Here’s a good summary of the meeting from the Bangor Daily News and a link to a video of the entire meeting. Our next public information meeting is scheduled for December 17. This meeting will serve as a supplemental Public Informational Meeting regarding the MEPDES discharge permit. We decided to hold a voluntary additional meeting with notice to all waterfront owners within a mile of the proposed discharge and intake in order to ensure that anyone with interest in the project has a chance to ask questions and discuss the discharge. As part of our commitment to be an active and engaged member of the local community, Nordic Aquafarms was pleased to be a reception sponsor at the Belfast Area Chamber of Commerce 57th Annual Awards Dinner on November 16 at Point Lookout in Northport. The reception and dinner gave us the opportunity to see many friends from the greater Belfast area and to meet many new people as well. It was especially gratifying to see local businesses being honored and to hear the compelling stories of the people behind their success. We are proud to be part of such a vibrant local business community. While it will be several years before was have any salmon ready to sell, it is not too early to be thinking about how we go to market and how we differentiate our product to consumers, restaurants and food service companies. One thing is clear, however – Maine will be an important part of the brand we are creating for our salmon. “I think the long heritage you have in the seafood industry in this state, and the image, and the cleanliness compared to other states, the more pristine setting, I think will be good for the brand,” Commercial Director Marianne Naess told the industry publication Seafood Source in the recent article Nordic Aquafarms plans to highlight local production in marketing of Maine-based salmon RAS. Naess, who is responsible for outreach and communications, told Seafood Source that Nordic Aquafarms plans to market 100 percent of the salmon raised in Belfast domestically and that we expect to produce a premium product, like the premium products we produce in our European facilities. Seafood Source is a publication of Portland-based Diversified Communications, the company that also produces the annual Seafood Expo in Boston, the largest seafood trade event in North America. Nordic Aquafarms will have a booth at Seafood Expo in March. As we have stated before, the by-products of our fish farming and processing – the nutrients we pull out of our discharge and the cut-offs from fish processing – all have value-added uses such as soil amendments, biogas, fish oils, cosmetics, pet food and many other possibilities. It is already clear that composting is a working solution in Maine. But we want to do more. We have recently met with leaders from the Downeast Lobstermen’s Association, based here in Belfast, and others in the Maine lobster community in regard to the potential use of our cut-offs (heads, racks and guts) as lobster bait. Based on these discussions, we understand that the cost and availability of bait is an increasingly serious issue for lobstermen. We also understand that under existing Maine Department of Marine Resources (DMR) rules, Atlantic salmon cut-offs from ocean net pen culture is prohibited due to the threat of introducing disease to the marine environment. With the disease prevention measures in our land-based facility and the traceability of a land-based product, we can provide a health certified bait from our processing facility in the future. We are committed to working collaboratively with industry and government representatives to see if our land-based operation can provide lobster bait. While we already have solutions for our by-products, we remain committed to exploring the best possible win-win situations in Maine. Nordic Aquafarms is not a fish feed producer, but we have a role to play in demanding healthy and sustainable feed ingredients from the suppliers. Right from the start, there has been a great deal of interest in the food we will feed our fish, but as company President Erik Heim has repeatedly stated, Nordic Aquafarms is not ready to finalize a feed choice because we are still two years away from feeding any fish in Maine, while new sustainable ingredients are rapidly emerging in the supplier markets. While we have stated clearly that we are pursuing natural, non-GMO ingredients, we have an exciting job ahead of us to finalize a feed formula that matches the pure profile of Maine and a high-quality product. We have created our own initiative, Fish Feed 2020, to work with suppliers and researchers to come up with the best possible feed by the time we are ready to start production in 2020. All the feed used will be fully traceable when we go into operation and all our feed will be fully USDA and FDA approved.